If only Nestle had used good green marketing efforts and communicated its efforts to green its bottled water business sooner, it wouldn’t be in the mess it’s in now. Right? Wrong! Contrary to what Kim Jeffery, CEO of Nestle Waters, laments to BusinessWeek, the real issue with bottled water lies in consumers’ minds (and the advocates who influence them), not in pricey carbon analyses showing that lightweighting the plastic bottle is the solution to reducing the environmental impact of bottled water. The real issue simply stated is that it’s environmentally wasteful to ship water across the country when supplies of clean fresh tap water are readily available — and legions of water bottle companies are lining up to make sure it is as convenient as branded bottled water to tote around. For insight into Nestle’s real problems, read BusinessWeek's companion piece by Judy Estrin, CEO of JLABs and author of "Closing the Innovation Gap." Taking her thoughts one step further, I can’t help but think that Nestle would be much better positioned to compete today if they had, like Intel with its move from making memory devices to making microprocessors, considered itself to be in the "convenient refreshment" business. Rather than simply focusing on incremental ways to make drinking Poland Spring bottled water less impactful through package-focused initiatives like lightweighting and recycling, it should have invested in new technologies to make tap water more pure and convenient. Leveraging the Poland Spring name onto Brita-like water purification systems might have been a start. Launching Poland Spring water purification tablets akin to Procter & Gamble’s "Pur" might have been another. Or putting the two ideas together into a Nalgene-type bottle that instantly purifies water on the go is yet another. Instead, by focusing on incremental environmental improvements like lightweighting, however worthy, Nestle stood by while companies outside its own industry stole its customers. Lesson: It's one thing to communicate greening initiatives, and another thing entirely to eco-innovate the next generation of green products that can speak loudly for themselves. Now, that’s truly sustainable. 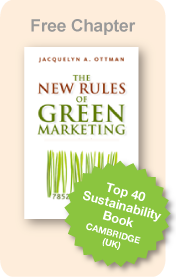 Tha'ts truly good green marketing.